So. I have joined a book group*. Or rather I have been allowed to join a book group (thanks Curtis Brown!) and this week’s BotW is our book group read from January. 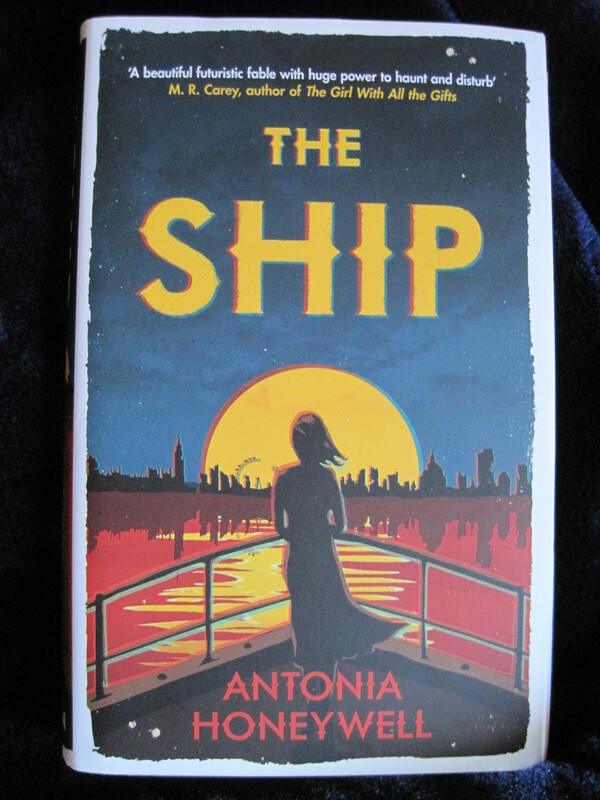 Antonia Honeywell’s first novel, The Ship, tells the story of a future where the world has descended into chaos – the food has run out, natural resources are exhausted, where people routinely disappear without trace, and you can only continue to exist if your identity card remains valid – forcing you to jump through hoops to keep it up to date. Lalla has grown up sheltered and protected by her father – who has been assembling a new life for them as her mother shows her around the British Museum. But when the new life – on board a former cruise ship where her father has had picked all the other residents – gets underway, Lalla grows uneasy – about her future and their destination. Now I’m not usually a big reader of dystopian future novels. I studied The Handmaid’s Tale at A-level – and read Brave New World, Children of Men and 1984 alongside that – but it’s not an area of fiction that I tend to pick up. But I really, really enjoyed this. It’s taut and full of suspense and keeps the reader guessing all the way through. It leads the reader with questions – and it provoked a lot of debate at the (online) book group. I don’t really want to say too much else about the book – because it’ll spoil it for you, but it’s definitely worth a read. It paints a very believable picture of a possible future – but it’s one that I sincerely hope never comes to pass. There are interesting characters – with flaws and secrets for the reader to uncover. One of the blurbs describes it as Hunger Games meets Handmaid’s Tale – and I think I could get on board with that as a broad summary of what is a really interesting and complex book. It has a beautiful cover – but I know that if I’d picked this up in the bookshop and brought it home it would have spent a long time sitting on the shelf waiting to be read – as I’m terrible for picking “light” fiction over books I perceive as harder work. But the book group deadline meant I read this – and I really enjoyed it. So clearly externally imposed deadlines will work on me – in a way that targets I set myself don’t! Anyway, The Ship is out in Hardback on February 19th – preorder it on Kindle, from Amazon, Foyles and Waterstones. So pleased you liked it – I hope it encourages you to read more dystopian fiction! Ready for next month’s CB Bookgroup pick! ?